My heart was all a flutter. Before the day was over. And not have to borrow from a neighbor. I wasn’t sure I’d finish on time. To curl up with a huge glass of wine. That drawer was no match for me. And my bling is as organized as can be. Is as old as time. And be rewarded with a big glass of wine. Epilogue: I found my vintage brooch and lived happily ever after. (and the wine was delicious)! 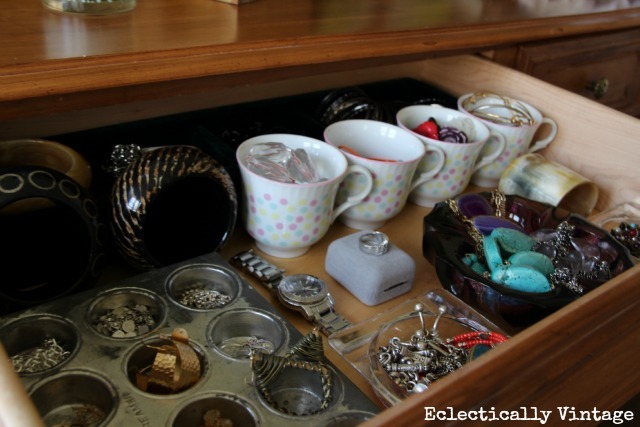 I’ll be organizing up a storm all year long – check out all of my Organization Ideas Here. Great story and you made me laugh! I so need to do this, too plus all the rest of the drawers and cabinets and closets. Wow. I need a really big glass. Ooooh…ahhhh. Just lovely! Can I borrow some jewelry? it looks so good! 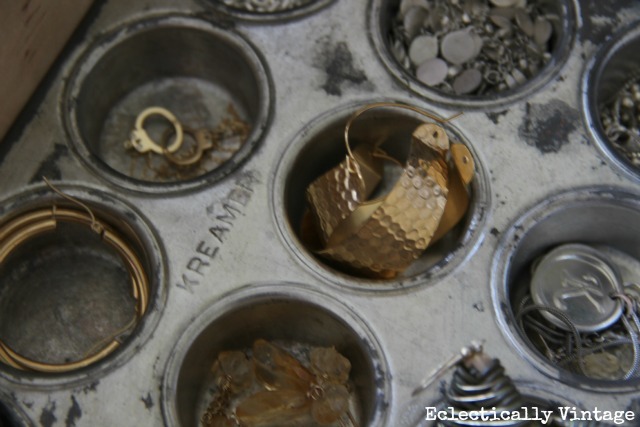 my jewelry is all in piles here and there….. one day i need to organize it! Your drawer looks amazing! I’ve used a wooden cutlery drawer divider to organize mine, works not too bad. How do you keep the cups from sliding when you open the drawer? Did you glue them down? And I love your poem! 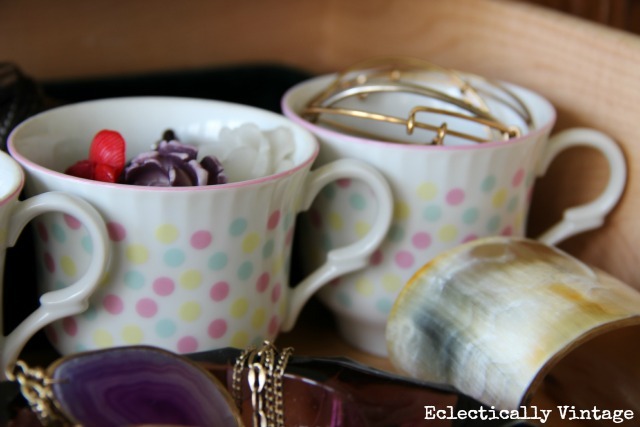 I totally need to tackle my jewelry, too — love all your containers to assist in the cause! Cheers! I’ll consider organizing my bangles and baubles, alive alive oh. Beautiful! That is a pretty drawer 🙂 Well done! Oh, I just did the same thing. I organized all of my jewelry, gave some away, and just prettied it all up. Love finding things that I had forgotten I had. You have the BEST jewelry collection! Looks awesome! I’m very impressed with your rhyming skills, up next rapping? What a clever post! I really liked the way you did it. I thought the organization was really well done. 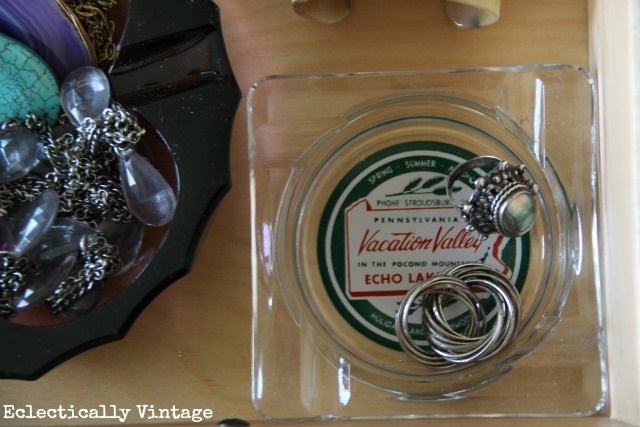 but i LOVE your little glass ash tray from echo valley….i have one from the poconos that my parents got on their honeymoon !! and i use it by my kitchen sink for jewelry too !!! lol ! Your poetic bling is a magical experience 😉 Glad you were able to incorporate some wine into your project. Have a great weekend! Hope this motivates me to organize my jewelry drawer. Yours looks great and sound like you had fun doing it. A little glass of wine always helps. You must smile every time you open your drawer. What a great idea Kelly! So neat and organized and so chic too! Kelly! First, so glad you found the brooch! Second, your new accessories drawer is amazing (and so are the baubles we spy in there)! Can’t wait to see the rest of what you’ve got coming this year. Will you come down to NC and organize our place? muffin tins and tea cups, how brilliant! plus just looking at them makes you feel happy! I am currently using plastic ice cube trays which DO NOT make me happy! I am going for cuter! Thanks! 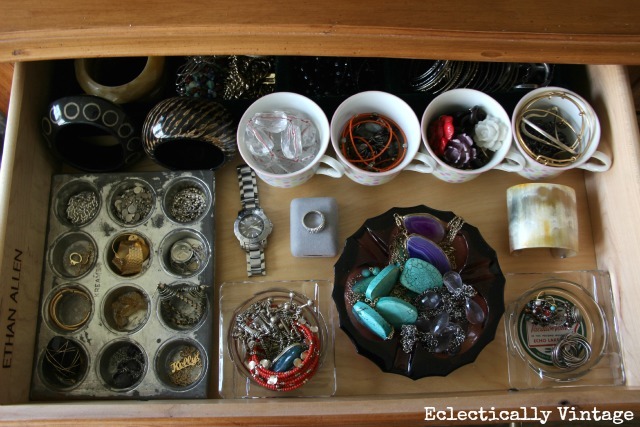 What a very clever way of storing and organizing your jewelry drawer. I have one that is capable of being organized but is badly in need of order.